For a lot of people, YouTube pretty much is the internet. It’s the world’s second largest search engine (next to Google, obvs), so we wanted to discuss how we use YouTube, get some great channels out there to you guys, and also find out what you’re watching and how you use. What we actually watch on YouTube differs quite a bit. We initially thought it would be balanced, but it very much isn’t. Void uses YouTube as essentially a TV with all sorts of cool shows and creators he loves, while Beej sees it more as a novelty for one-off views. Beej doesn’t have much that he watches: VetRanch, Dr. PimplePopper, Woodworking for Mere Mortals, ObeseToBeast, RunSelfieRepeat, various funny puppy and kitty clips, CineFix, and catches up on clips of late-night shows or music videos. And really, that’s about it. Void, on the other hand, uses PLEX to stream YouTube to his TV where he follows various channels and creators like most people do their network sitcoms and police procedurals. Book Recommendation: Ahsoka by E.K. Johnston. 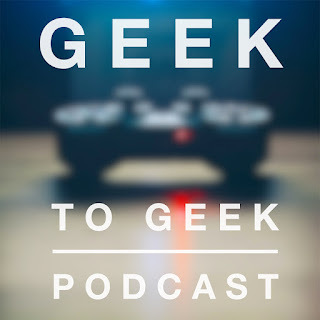 Snag it for free at audibletrial.com/geektogeekcast and support the podcast! I pretty much watch YouTube for home improvement/repair help and occasionally a bad lip reading or How it Should Have Ended. I subscribe to channels to be nice, but don't usually watch the channels I subscribe to. That's really interesting. I guess I never thought about subscribing to a channel just to be nice.